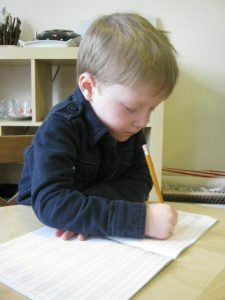 The Westboro Montessori School toddler classroom is carefully prepared to meet the age-appropriate needs of our students, accommodating a maximum of 10 children aged 18 to 36 months, with one teacher and one assistant. At WMS we foster the child’s independence by facilitating a smooth and peaceful separation from his/her parents and help him/her adjust to the prepared school environment. Our mandate is to create a nurturing and secure environment where young children can choose lessons from the low shelves in the classroom and work on them independently, or to work with a teacher or friend. All furniture is a size that allows maximum independence and the toddler materials are designed to be attractive and inviting to the children. The WMS toddler program takes advantage of the rapid growth of fine and gross motor skills that takes place at this stage of development, and focuses on language and motor development and helping children build trust in relationships. At Westboro Montessori School we have five main areas of curriculum and activity at the toddler level: Practical Life and daily living skills, sense awareness, language development, movement, art and music. Include care of self, care for the environment, cleaning, pouring, spooning, polishing, kindness, and respect. These practical life tasks give the child a meaningful degree of independence and self-discipline. The prepared environment will provide material for refining the auditory, visual and tactile senses. Sense awareness is learning about dimensions, shapes, colours, touching, hearing, tasting and smelling. Through phonetic material and sensorial activities the child will learn to develop and master their vocabulary. Story telling will be an important part of the language component as well as pre-reading skills. Cognitive activities expand the toddler’s ability to focus and think – they aid in developing problem-solving skills. The child will have a basic introduction to qualitative and quantitative concepts including numeral recognition. Social development is encouraged through planned group activities such as circle time, snack time, and story time. Motor activities are separated into two categories: Large motor development includes the use of the gym where children can run, play with balls, practice balance and refine whole body coordination. 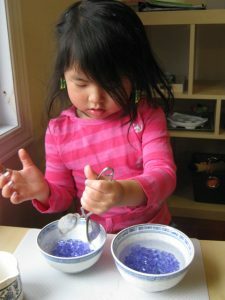 Fine motor skills are explored through pouring, using tweezers, and other transfer work, as well as cutting and drawing. Art activities will help the child express their own creative ideas by using various materials along with sensory exploration of materials. Toddlers love songs that require physical responses. Music classes will provide playing instruments and dancing/body movements. At WMS, we have developed our program around the principle that toilet training is an essential and important part of a child’s physical and psychological well-being. In the initial stages of toilet training, the child will wear diapers or pull-ups during their nap time. An appropriately sized washroom for toddlers is conveniently located next to the classroom, facilitating the toilet training process. Dr. Maria Montessori believed that children have an inner need to “help me do it myself.” As preschool children make sense of their world, they are exploring how to participate in everyday activities and explore their relationship with their surroundings. Children are born with what Maria Montessori described as the absorbent mind-the ability to absorb information about their culture and environment without a great deal of effort. At WMS a Montessori education focuses on the natural curiosity and desire for knowledge within each child. Practical life skills are designed to reinforce care of self, for others and their environment. The activities help in the development of hand-eye coordination and concentration. 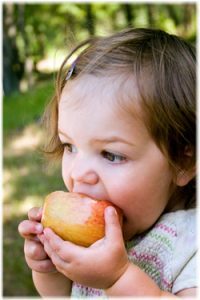 The sensorial materials help children develop cognitive skills through the five senses. Reading and writing are fostered as children learn the phonetic sounds of the alphabet, decoding and encoding words and letter formation. Through the use of concrete materials children learn basic mathematical concepts. The Kindergarten year at WMS provides an extraordinary opportunity for children to develop leadership skills. Kindergarteners act as positive role models for the younger children, assuming positions of responsibility that further strengthen their own capabilities and self-esteem. They have arrived at the pinnacle of their first phase of human potential. Our unique daily structure ensures that students receive instruction each day in both of Canada’s official languages. Equal time is given to each language and students thrive in the bilingual environment. This allows them the time and exposure needed to acquire the French skills to succeed in the upper years. At Westboro Montessori School, we use French in the classroom in order for the children to obtain, process, and construct subject matter information in both the spoken and written form. The children use French daily for their own personal expression and enjoyment as they interact with their peers. We use various learning strategies to extend the children’s communicative competence. Click on the “French” tab above for more details. Every summer in July and August the Westboro Montessori School offers a summer camp to students attending our school and new WMS students. Our summer camp includes a range of fun and stimulating sessions in sports, arts, music, outdoor education, and academic enrichment. With our full day program, each with a special focus, you have the flexibility to plan an active, exciting, and educational summer for your child. The perfect balance of recreation and learning, our camp is structured, stimulating, and welcoming. Need to send your child to camp early or late? We provide before and after camp care. Pre Camp: 8:00 a.m. – 8:30 a.m.
Post Camp: 4:30 p.m. – 5:00 p.m.
We at Westboro Montessori School have recognized how important it is to incorporate the French language into the Montessori Casa Curriculum. Our unique daily structure ensures that students receive instruction each day in both of Canada’s official languages. Equal time is given to each language and students thrive in the bilingual environment. This allows them the time and exposure needed to acquire the French skills to succeed in the upper years. 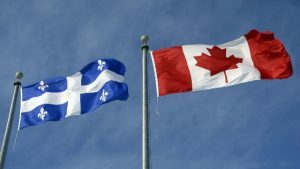 Studies have shown that parents’ choice of Early French Immersion is frequently based on a desire to give their children an opportunity to become functionally bilingual through an earlier and a maximum exposure to French. Young children usually have less reticence in imitating a French role model, and therefore take more risks in expressing themselves in French and get more practice. An early start during the children’s “optimal age” for language learning facilitates the second language. An early start provides for more time and more opportunities for the child to develop the language in and out of school. Children are naturally very enthusiastic learners and they seem to learn everything with ease including second languages. Younger learners are very open-minded, which makes them less self-conscious and less apprehensive than older learners. Parents have much more of a say in the decision than at a later age. At Westboro Montessori School, we use French in the classroom in order for the children to obtain, process, and construct subject matter information in both the spoken and written form. The children use French daily for their own personal expression and enjoyment as they interact with their peers. We use various learning strategies to extend the children’s communicative competence. We teach individually and in small groups of two or three students at a time in order to enrich the children’s knowledge of French vocabulary, pronunciation and common usage. We have one person in each classroom who speaks only French to the children. We have French Summer Camp in July and August. All of these measures ensure that the graduates of our Casa Program successfully enter into, and succeed in the Grade One French Immersion Program. The Westboro Montessori School offers a musical after-school program for the students of WMS, as well as a music program offered to the public of all ages. We offer piano lessons structured individually for all ages and levels, as well as preparation for the Royal Conservatory of Music examinations. Music is such an integral part of our culture. The study of music is part of life and should not be left unexplored. Learning music is a great benefit, especially for the child. Music, especially classical music, when played at early stages of a child’s development will help open gateways of opportunity for advanced learning. This means that exposing your child to classical music may help him become a better math and science student later in life.